The Organic Chemistry of Biological Pathways was written for an audience of advanced undergraduates and graduate students who want a deeper understanding of the chemical reactions that take place in living organisms. The authors assume readers have a background in organic chemistry at the level of the typical two-semester college course. Although enzymes are crucial to biological reactions, the authors’ focus always remains on the reactivity patterns of the substrate molecules and on the organic, arrow-pushing details of the individual reactions. The authors begin the book with a brief review chapter on the fundamental organic reaction mechanisms commonly found in biochemical pathways. Following this brush up on reaction mechanisms is a general introduction to the main classes of biomolecules. Then comes the heart of the book: full chapters devoted to the major metabolic pathways of the main classes of biomolecules—lipids, carbohydrates, proteins, nucleotides, and secondary metabolites. 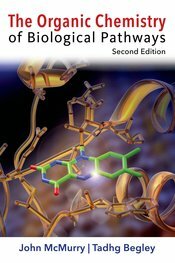 In the course of these chapters, readers cover the chemistry of the common coenzymes, see examples of the common sorts of biological transformations, and ultimately begin to develop an understanding of the patterns found throughout bioorganic chemistry. The authors conclude with a summary of the reaction patterns and mechanisms frequently used in nature to effect chemical transformations, followed by a brief chapter summarizing some general themes of enzymatic catalysis. All mechanisms have been updated in this second edition, and several hundred references to recent literature are given for those students who want more detail.